In Australia alone about 2,000 out of every 100,000 people will become the victim of theft. 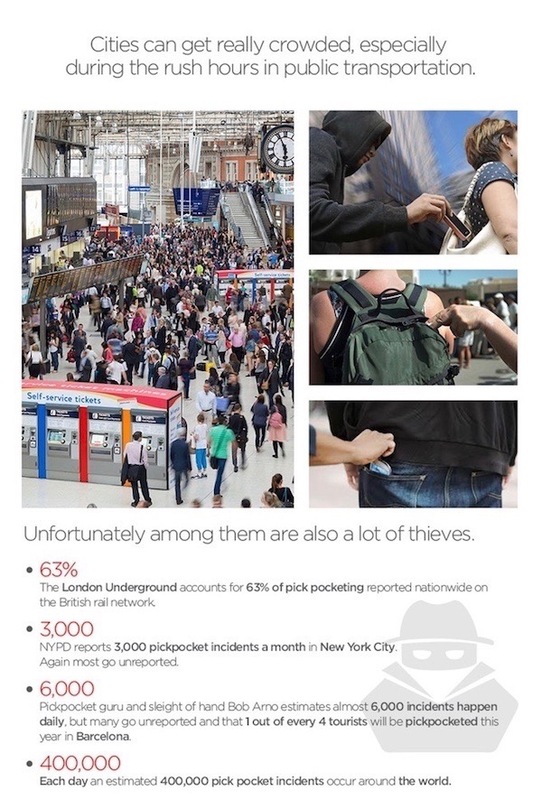 On top of that, there are more than 400,000 pickpocket incidents occur worldwide every day. Tourist areas in North America, Europe and beyond are full of pickpockets, especially in crowded attractions. While every year, we could not stop our way to discover the world. So here are the most common question: "I'd like to travel to Europe solo this summer with nothing more than a backpack. Any recommendations for backpacks with anti-theft features, like slashproof fabric and locking zippers? " But, you'll never worry about this happening to you when with an Anti Theft backpack. So what do you need to know about theft proof bags for travel? Are they worth the splurge and do you need one at all? What types are on the market? We’ll discuss here. What Are Important Features for an Anti Theft Bag? It’s easy to get caught up in all the bells and whistles, but there are only a few features that your theft proof bag actually needs to have. The first is zippers or some sort of closure. Most crimes are crimes of convenience when travelers leave their open bags out of sight. While some theft will cut you bags to get you purse, so cut-proof material should be must-have features. It’s also nice to have a carabiner or clip for your zipper so that someone can’t come up to you and pull on it. Hidden pockets are also a good idea, as someone has to really rifle through your bag to find your wallet and important documents. Thieves are organized. They work in teams, with well-designed plans and years and years of experience in stealing people's prized possessions. Anti-theft bags certainly won't eradicate these crime syndicates, but they CAN help you prevent theft while on the go. And most importantly keep your precious memories and belongings safe in your bag. Now, Discover all about the revolutionary new theft proof backpacks and laptops, either for travel or daily work.